The current edition of the Pew Forum on Religion and Public Life Weekly Update includes two items that I found noteworthy. The first is a story from National Public Radio titled "Some Muslims in U.S. Quietly Engage in Polygamy." As Muslim immigrants bring their culture with them to the U.S. this includes their marital customs such as polygamy. According to the story, "No one knows how many Muslims in the U.S. live in polygamous families. But according to academics researching the issue, estimates range from 50,000 to 100,000 people." These Muslims have a lower profile than other groups that practice polygamy such as the various forms of fundamentalist Latter-day Saints (with no formal connection to the LDS Church), and thus they receive far less public scrutiny and critique. But this story comes at a time when the Fundamentalist LDS Church is engaged in an ongoing struggle with Texas authorities over polygamy and child custody, and when this is connected to the prolonged conflict between the Western world and certain expressions of Islam, it will be interesting to see if public discussion of such Muslims becomes more frequent and takes on a critical tone. "And I began to realize that there is a whole segment of the evangelical movement –many of those folks who are in the elite – who were trying to distinguish themselves from the rest of the evangelical subculture. And so I began to think more about this and pay more attention to it. And the real divide, in my opinion, in evangelicalism is not between the left and the right; it’s not between the young and the old. It is between a group that I call the “cosmopolitan” evangelicals and “populist” evangelicals. And these are very, very significant divisions. "You see, populist evangelicals are what we oftentimes think about evangelicals. These are the folks who are culture warriors, who say that they want to take back the country for their faith. They see themselves as embattled against secular society. They are very much concerned that they are in a minority position, and they’ve got to somehow use very strong-arm tactics to win the day. "So that populist evangelicalism is alive and strong, especially in the evangelical subculture: the music, the publishing, the entertainment segment of the evangelical subculture. But there is a whole other segment. The people who I interviewed, by and large, fit more this cosmopolitan outlook. They are less interested in taking back the country for their faith. They really are more interested in their faith being seen as authentic, reasonable, and winsome. 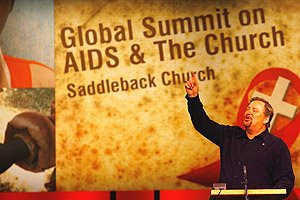 So they still have an evangelistic impulse, but their whole modus operandi looks quite different. Because of that they have different ultimate goals of what they are actually trying to achieve. They want to have a seat at the table. They want to be seen as legitimate. They are concerned about what The New York Times or TIME magazine thinks about evangelicals because they [the cosmopolitan evangelicals] are concerned about cultural elites. They want legitimacy. Legitimacy is actually more important to them than necessarily taking back the country. And so that cosmopolitan-populist divide I find to be quite significant." In my view, Lindsey has recognized an important difference within evangelicalism, but I would argue for more depth in the understanding of the cosmopolitans. While many do indeed want a "place at the table" in popular cultural discourse, their actions and differences with the populists must be accounted for by something beyond seek legitimacy. Indeed, it could be argued that the assume legitimacy and that they then seen to express this legitimacy outside of the evangelical subculture to engage the broader world. In my experience many evangelicals are rethinking what Christian spirituality means and how it is to be lived in light of a post-Christendom, globalized, pluralistic culture. This involves the need to rethink the roots of the Christian faith, to reflect more on the ministry and example of Jesus, and to constantly bring theology into dialogue with culture. This process of reflection results in a cosmopolitan form of evangelicalism which is very different from its more populist expressions of the past. One of the areas of ongoing reflection for me is bringing my Western cultural and theological assumptions into dialogue with that of world Christianity. As many people are aware, Christianity is growing and vibrant in the Southern Hemisphere in contrast to the North, and this "new complexion" for Christianity means that Christians in the Global North, particularly the West in nations such as the U.K., Australia, New Zealand, and even the good old United States of America, might have a lot to learn about our faith in dialogue with expressions of Christian community in other parts of the world. One of the books I recently finished is Whose Religion Is Christianity? : The Gospel beyond the West (William B. Eerdmans Publishingn Company, 2003) by Lamin Sanneh. As the back of the book describes, Sanneh is "a native of Gambia, and is D. Willis James Professor of Missions and World Christianity and professor of history at Yale Divinity School." He is the author of a number of interesting books including Translating the Message: The Missionary Impact on Culture, Encountering the West: Christianity and the Global Cultural Process - The African Dimension, and Abolitionists Abroad: American Blacks and the Making of Modern West Africa. In this helpful short volume Sanneh defines "world Christianity" differently than "global Christianity" where the former "is the movement of Christianity as it takes form and shape in societies that previously were not Christian," whereas the latter is "the faithful replication of Christian forms and patterns developed in Europe." 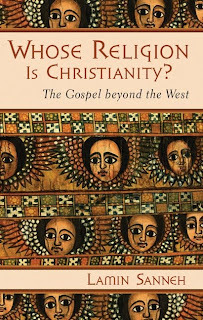 As Sanneh develops his answer to the book's title by way of reflection on world Christianity, particularly in its African expression, he does so by way of "indigenous discovery of Christianity rather than the Christian discovery of indigenous societies." By framing his discussion in this way and reversing standard missions approaches to the topic, Sanneh not only addresses how Christianity has been communicated across cultures beyond the West, but emphasizes discovery of Christianity by diverse cultures in ways that resonate with their cultural concerns. These and other comments within the overall context and arguments of the book provide the content for missional and ecclesiological reflection by evangelicals and other Christians. In the past I've benefited from reflection on world Christianity in terms of the growth of the church and new forms of theologizing in China, and through Sanneh's encouragement I need to reflect on what can be learned from the situation in Africa as well. Such reflecitons will faciliate a balance resulting in what my friend Matt Stone refers to as “'globally informed, locally embedded Christianity' or 'glocal Christianity' for short." The Pew Forum Weekly Update includes a few items of interest. 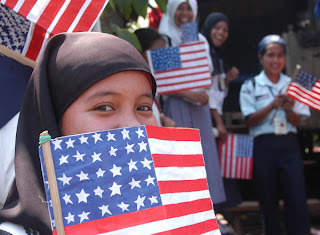 First, data files from the Pew Research Center's 2007 survey of Muslim Americans are now available to scholars and researchers. The complete report is available here. The Update also includes a story that reports on a Faith Angle Conference that looked at neuroscience and the idea that our brains are hard-wired for belief. A quick review of previous conference topics revealed a couple of items that caught my eye that might also be of interest to readers, including one on religion in a globalizing world from December 2006 featuring comments by the noted sociologist Peter Berger, and a May 2007 conference with the topic "Mormonism and Politics: Are They Compatible?". Some time ago I heard an evangelical professor make comments in a video resource that articulated his theological concerns about the beliefs of a new religious movement in terms that drew upon classic and ancient Christian creedal expressions. This was appropriate given the Christian audience to whom his comments were directed, but it made me wonder why we haven't developed theologies that are contextualized for the cultural and subcultural concerns of the new religions that we interact with. Why do we continue to present theological formulations from the early church that are not brought into dialogue with contemporary cultural circumstances? I am not at all suggesting that we ignore the ancient creeds, but our historical reflections must also take into account diverse cultural circumstances of the present. These reflections, coupled with my desires to develop contextualized theologies for the post-Christian West, led me to purchase and recently finish reading two volumes, Dean Flemming's Contextualization in the New Testament: Patterns for Theology and Mission (InterVarsity Press, 2005), and Robert J. Schreiter's Constructing Local Theologies (Orbis Books, 2002). I was familiar with Flemmings work due to my exposure to an academic journal article he wrote on Paul's preaching at the Areopagus as a paradigm for cross-cultural communication, but I was not familiar with Schreiter's work until recently. Flemming's work serves as a helpful reminder that the New Testament writers practiced not only a contextualization of the gospel in their proclamation within Judaism and then beyond it as the gospel crossed cultures, but that the early apostles also developed various theologies that were appropriate to the local circumstances of various Christian communities and the cultures in which they were embedded. "Indeed, so many new questions were emerging that the credibility of existing forms of theology was weakened. For example, questions about the eucharistic elements: How was one to celebrate the Eucharist in countries that were Muslim theocracies and forbade the production of importation of fermented beverages? What was one to do in those cultures where bread products such as bread were not known, in which the unconsecrated bread itself became a magical object because of its foreignness? Or how was one to celebrate baptism among the Masai in East Africa, where to pour water on the head of a woman was to curse her with infertility? How was one to understand Vatican Council II's opening to non-Christian religions in countries in southern Asia where Christianity seemed destined to remain a minority religion?" In order to address these questions in ways that are theologically and culturally responsible, Schreiter suggests that we need to develop local theologies. He defines this as a form of theology that "begins with the needs of a people in a concrete place, and from there moves to the traditions of faith," and which involves a "dynamic interaction among gospel, church, and culture." Schreiter sees this starting place with culture as a strength as it begins "with the questions that the people themselves have" rather than the concerns of the church that often result in a theology and ecclesiology disconnected from local cultures. 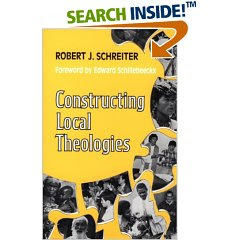 As Schreiter develops his thesis he not only defines local theology, but also includes discussion of mapping local theologies, the need to understand local cultures (where he includes an emphasis upon listening), as well as a consideration of the context of theology as church tradition interacts with local theological perspectives. In discussing the latter topic he includes a helpful reminder that our perspectives for understanding are strongly influenced by culture, including church tradition in its forms and formulations. He reminds us that in spite of our assumptions they are not supracultural and are "always born in some cultural context." With this insight we are reminded that "the great theologies of East and West have drawn upon philosophical systems elaborated in their respective cultures to frame their questions and their answers." In the chapter that discusses theology and its context I found a particular question Schreiter raised most interesting when he asked: "What is the relation of the form to the local culture conditions?" This question is deceptively simple, but in my experience I am not aware of many evangelicals consciously reflecting on this question either in activities among new religions, or among church planting efforts or the day-to-day existence of well established churches. Schreiter also discusses the issue of Christian tradition and identity, popular or folk religion and its relationship to "official" religion, and a chapter devoted to syncretism. His discussion on syncretism is especially helpful as he distinguishes between various types of "dual religious systems," and then raises a series of issues and questions related to the topic. Along the way he states that "Syncretism and dual religious systems raise the question for Christians of how serious we really are about contextualization." Indeed, with the seeming trend in evangelical missiology toward increasing conservatism as it approaches the issue of contextualization Schreiter's query seems to prod us toward a balance of careful reflection as well as daring experimentation in the contextualization process. Near the end of Schreiter's chapter on syncretism he raised some issues that echoed my seminary experiences in my reflection on folk religions in the world's great religious traditions and how this relates to dramatically and foundationally different religio-cultural ways of understanding the world. Schreiter asks, "Is there a Buddhist way of being Christian, or a Hindu way of being Christian? Those two great traditions have been able to accommodate Christianity, but Christianity does not seem able to accommodate them." He notes that these are not easy questions for Christians to answer not because they deal with Christian doctrines as many evangelicals might assume, but rather because they touch on "Christian exclusivist thought patterns." He then asks, "Are those thought patterns essential to Christianity, or do they represent certain cultural categories only?" I recognize that Schreiter raises issues that will cause many conservative evangelicals to shudder, perhaps even reject his basic thesis outright, as demonstrated by an email conversation I had with a Christian professor not long ago who questioned whether it was accurate to speak of Christian "theologies" in the plural. Added to that, the connection of contextualization to the process raised even more red flags. But in my view Flemming and Schreiter are on to something. The biblical material includes numerous examples of contextualization of not only the proclamation of the gospel but also in the development of various local theologies for differing Christian communities. It seems to me that Western Christianity has lost sight of this and it is time to bring theology and culture together as ongoing dialogue partners so that the Jesus story and Christian spirituality might be told and lived in ways that draw upon the lifeways and concerns of local populations. Volume 3, Number 1 (Spring 2008) of Sacred Tribes Journal is now available online. Readers must create an account and login in order to read the free publication. George Barna, who conducted the research and presented the findings, noted that in the religious world seemingly small matters can make a big difference. "All three of these groups claim to be Christian, uphold the importance of faith and spirituality, are active in their churches, generally believe in the same God, and accept the holiness of Jesus Christ," Barna commented. "Beyond that, there are huge difference related to central doctrines such as the means to eternal salvation or the reliability and authority of the Bible. Millions of adults, however, shut the door when Mormons or Jehovah’s Witnesses come visiting without having any real idea what they or we believe - or caring enough to pursue such insights." Barna indicated that such front porch interactions could stimulate unexpected benefits. "It’s no secret that Americans spend little time thinking through the deeper applications and implications of their beliefs. In a society confronted with challenging issues such as immigration rights, gay marriage, war, and environmental crises, our positions on such matters should come from a well-conceived and deeply embraced theology of life. Sadly, most Americans react on an emotional level rather than from a worldview that is based on thoughtful convictions. Perhaps having a Mormon or Jehovah’s Witness ringing our doorbell and pushing us to explain or defend our beliefs could be a catalyst for an even deeper process of discovery - especially if we enter the conversation knowing that we probably have some substantial disagreements on core elements of faith." I know that it is too much to ask that Barna might consider cultural aspects of these new religions beyond doctrinal issues, or advocate a broader form of understanding and cultural engagement with these groups be undertaken by evangelicals, but at least he speaks positively about the potential for doorstep encounters. Now if only these encounters could move beyond doctrinal debates, and perhaps even move beyond the doorstep to involve actual relationships and dialogue. The update may be read here. Update: Readers can learn more about Doe Daughtrey's research on the Mormon and Pagan/New Age synthesis at her blog, as well as her MySpace page. You can also network with her at Facebook group page. Before I relocated to Utah from northern California three years ago to enter the intercultural studies program at Salt Lake Theological Seminary I joined several Yahoo! Groups on Paganism in Utah. This later proved very helpful, not only in developing relationships with the local Pagan community, but also in becoming aware of a phenomenon in Mormonism. I soon came across the term “Morwic,” which I have blogged on previously. This term was coined by a woman in Utah who is an active Mormon and who also practices various forms of the New Spirituality and Wicca. Further research indicated that this had become known by others, and was referred to in a past Salt Lake Tribune article as a phenomenon involving “LDS Double Dippers.” As I was taking a course on Mormon culture I used the opportunity to write a paper on this phenomenon, and one of those people I interviewed for my ethnographic research was Doe Daughtrey, a Ph.D. student at Arizona State University. Doe has been researching this for some time, and has written articles on it for Sunstone, while also giving presentations at Sunstone Symposium on the topic. After several months of trying to connect for an interview, Doe and I recently found some time to discuss this fascinating cultural and religious synthesis. Morehead's Musings: Doe, thank you for agreeing to discuss the interesting intersection between religious practices and ideas. Let’s begin by discussing what interested you personally and professionally in this topic and how would you describe the phenomenon that is the subject matter of your Ph.D. work? Doe Daughtrey: Well, I've described it in various ways. At first I thought, I was going to be looking at "Mormon Pagans," and that's just a euphemism for people that do something different that are engaged in the New Spirituality, or the cultic milieu of the twenty-first century. But when I was doing my IRB application for human subjects I made it clear that I was going to be talking to people who didn't necessarily know anything about what I was doing and so I needed to put it in as terms as plain as possible. In that application it was framed as a popular religion dissertation project. I was going to be looking at spiritual practices of Mormons with an emphasis on LDS women. More recently I have come to see it as a broader kind of project where I really am looking at Mormonism and the New Spirituality. Because really the Mormons are not any different from other Americans in that they are dipping into that pot of diverse beliefs and practices. So my argument is going to be that, yes, twenty percent of evangelicals may believe in reincarnation, but Mormons have a context for that, it's embedded in their tradition.When I was doing my master's thesis, my committee members and other people who came to my various presentations asked how I got into these topics and my response was, "Cheap therapy!" This writing has been therapeutic for me. In terms of my own practice, fifteen years ago I was having bouts of depression and concerns about my status as a woman in the LDS Church, and I'd had several experiences that highlighted what I perceived at the time to be my marginal status. I was suffering a lot, and so I was trying solve these problems. I've actually found that a lot of the women who do Reiki and other kinds of alternative healing modalities come at it from the same perspective. When I ask them how they came to do this they inevitably will say, "Well, I was really, really sick," or "My children have been sexually abused," or "I have been sexually abused." So they are trying to solve this intractable problem that priesthood blessings didn't solve, that personal prayer, reading Scripture, or even therapy didn't solve. So that is pretty much where I was. I was trying to resolve some intractable health issues, and as a result I went to massage therapy school. I didn't know anything about it at the time it felt a little dangerous. I have a very dear friend who was also Mormon and a massage therapist, but I never saw myself as possibly getting involved with that. I didn't know what all it entailed. But that opened the door to all kinds of things. That was my entry into an eclectic kind of Mormonism. And I didn't see any kind of incongruities between being a massage therapist and going to Relief Society on Sunday. It was very practical for me. I was trying to solve some problems and for whatever reason I was not able to access what I've been told should have been my primary entrance into the realm of healing. Morehead's Musings: To some readers the thought of an intersection between Mormonism and various forms of the esoteric may seem strange, to some even heretical, but can you briefly sketch the historical intersections between various forms of spirituality in the cultural and social currents of early Mormonism and how they may also find expression today? Doe Daughtrey: In terms of esotericism, there are several ways to approach looking at esotericism. I love Wouter Hanngraaff's first distinction of esotericism as it doubles for the generic term "occult." So in that definition, esotericism stands in for psychic, mystical, and other kinds of paranormal topics. Then you've got as a kind of experience of direct gnosis, or a non-rational way of knowing. And you've got esotericism as secret teachings or teachings that are only conveyed to certain people. Then you've got something called "Western Esotericism," a sort of container concept for the hermetic revival, including things like Theosophy, Rosicrucianism, studies of the Qabala, etc. So I think it's pretty clear if you look at those, anybody who's interested in one of these kinds of definitions of esotericism it's pretty clear that Mormonism is obvious as having facilitated or expressed all of those definitions. For instance, Mormonism has always facilitated psychic and paranormal events, and validated those kinds of experiences, direct experience and apprehension of the divine, both institutionally and individually. You've got Mormon history, too, that is so full of great stories about communication beyond the veil, prophetic dreams and patriarchal blessings. My experience has been that really serious Mormons understand that they can routinely receive that kind of direct revelation. Then you've got that form of Mormonism that sees itself as a restoration of primitive Christianity, possibly the original religion of the world. My favorite book title is Latter Days: A Guided Tour Through Six Billion Years of Mormonism by Coke Newell. That says it all! In the Mormon mind, the story of Mormonism is the story of the earth and then the universe. Also very well known is the idea of the esoteric and sacred secrecy in the temple rituals, and they are only accessible to those who have temple recommends. And of course John Brooke, who did The Refiner's Fire: The Making of Mormon Cosmology, he did that piece, looking at hermetic culture. What I like about his book is the image of the hourglass he uses to talk about how all of those historical trends, or fragments as he calls them, trickled down through the middle of the hourglass into Joseph Smith's consciousness and then out come out into the classic Mormon cosmology. Historically then, early Mormonism was embedded in this larger cultural practice of treasure hunting, divining, and he ended up creating this religion that combined those things with Swedenborgianism, Qabala and hermeticism. Mike Quinn looked at some of that too in Early Mormonism and the Magical World View, and Harold Bloom touches on this in The American Religion. What I love about Quinn's book is that the table of contents reads like a New Age bookstore shopping list. So Quinn and those others have done work that has been really valuable. I think that what Mormons are doing now is not any different than what was done in the past. Like other nineteenth century Americans, early Mormons were involved in divination, divining rods, astrology, and choosing auspicious dates for important events. What's significant is not that they were doing this – everybody was – but that they created a religion that wedded folk magic to Christianity. Morehead's Musings: In your research, and on the Facebook group called “New Age Mormon Pagans” that you have created to facilitate this and network with individuals on the topic, you mention several facets of various esoteric traditions that you see as having parallels or analogies in Mormonism. Can you describe this? Doe Daughtrey: The categories I'm looking at are channeling, spiritual healing and personal growth, New Age science, and Neo-Paganism. For our discussion today I'd like to focus on one of these areas, that of channeling. It's kind of the primary and most easily constructed analogies or comparisons. It also easily connects with my own experience as a Mormon. Many of the experiences that Joseph Smith had are those which Mormons of my generation continue to aspire to. What I mean by that is I recognize the LDS Church has changed in the last thirty-five years and that Mormons who join today might not have those kinds of goals, but at least those of my generation really took very seriously the King Follet Discourse, for instance, and Smith's command to replicate his experiences. So I really like seeing scholars, like Catherine Albanese and some others, define channeling as revelation. It works for me. There's a disclaimer that goes with that in that not all channeling can be compared in that way with revelation. But my main interest is how Mormons interpret it when they are integrating it with their spiritual practices. I'm looking for people who participate in channeling as it is created in the New Age movement. So what channeling is, then, is a kind of communication that originates outside an individual's consciousness. It might involve trance states; it could be automatic writing; and it can definitely be a learned skill. It's a lot like cultivating a psychic ability--you could find all kinds of books on New Age or in the mind-body-spirit section of the bookstore that have instructions on how to develop various kinds of intuition and psychic abilities. Then there's also the idea of channeling one's higher self for healing and self-discovery and another kind that is seen as direct communication with ascended masters who present programs for living. J. Z. Knight is one that I am particularly interested in. She claims to channel Ramtha who is a 35,000 year-old ascended master who was a Lemurian subjugated by the Atlanteans. So Ramtha calls Knight a "pure channel," or somebody who has a near-death experience. He says he operates through her brain. This, of course, is different from someone trying to develop psychic abilities. I'm interested in channeling in Mormonism, or messages that might resonate with Mormons in terms of being able to interpret them as being channeled revelation. So I didn't know when I started this that I had several LDS friends who were students at Ramtha School of Enlightenment. His main message is "You are God." That has really connected with them. It's a very Mormon message, "you are the same species as god," "you can become god." But it's not just the message. Yes, the message is great and that attracts them, but it is the experiential part that I have found that is the especially important to them. Mormonism has become so practical and this-worldly that these friends of mine have felt compelled to look somewhere else for deep discussion and experiential opportunities that blend the practical with the mystical. My own experience was that I did not have the tools – Mormonism gave me great and expansive doctrine – but just prayer, just reading the scriptures, just getting a priesthood blessing, while really compelling to a lot of people, if it doesn't help you, and those are the only tools that are authorized, then that's a problem. The experiential part has been important to these women who have been involved in Ramtha, especially since they lack access to the priesthood. The priesthood is not just the power to act in the name of God at the institutional level, but it's the power to do what God does. What Ramtha's school does is provide a pivotal experience in their lives. If I understand it right, they create a card containing a visual symbol of importance to them, after which they are blindfolded and sent into a field and asked to intuitively find their cards. Two hundred people blindfolded in a field! This is a pivotal moment for them, an experiential moment of being god, of putting into practice that they are god. And they do not feel like they've had that in Mormonism. They don't go and talk about this at church, but even though there's nothing like that in Mormon practice, it's perfectly legitimate to them from their perspective. Morehead’s Musings: Do you think there is a sense for them that one of the Mormon ideals of exaltation that might in some sense seem unattainable as they go through life in the LDS ward, and yet through New Age kinds of practices it seems more experientially attainable? Doe Daughtrey: Yes. I wouldn't have put it that way but let me tell you this story. One of my best friends had worked in the temple for years. She studied, she prayed, she had done all of this, she was incredibly knowledgeable about scripture, and she'd read the extra-canonical stuff. She kept asking questions about the things she was experiencing and she said no one in the temple had a clue. They didn't understand the questions. This was the only place where she could legitimately ask questions and yet none of the people who routinely worked in the temple seem deeply curious about exploring anything but the most shallow of interpretations of doing temple work so that dead people can choose between Mormonism and something else. After attending the Ramtha School of Enlightenment and discovering that she could find her card blindfolded, she quit going to the temple and never went back. She said, "I got it. I got what the temple is there to teach me. I really am God, and I don't need to go back now." What she really got at the deepest level is what Joseph Smith said near the end in that the most important thing for human beings to is to learn to become God. In the other categories I'm going to be making connections to include Mormon concepts of reincarnation or rebirth, what multiple probations look like, and what work that has been done looking at Joseph Smith's teaching on reincarnation. One of my dissertation chapters is titled "Molly Mormons Can Be Reiki Masters Too." This one will look at alternative healing practices and how these compare to the priesthood in Mormonism. I want to know how women who do or receive Reiki interpret priesthood. Some women I talk to say, "It's priesthood power and I'm using it and I don't care what they say." And others say, "Oh no, it's nothing like priesthood power and I'm not in competition with the priesthood. I'm just being a good LDS woman. God told me to do this and I'm doing what I'm called to do." So there is very much this sense of calling in relationship to these alternative healing things. Also in that chapter I'm going to be looking at things as seemingly mundane as the huge number of herbal supplement companies that have been created by Mormons and based in Utah as part of self-reliance, herbalism, etc. In the Neo-Pagan chapter I'm going to be looking at those I call MormoPagans, who I discussed in one of my Sunstone presentations a couple of years ago. Like the other categories, there is a spectrum of belief and practice. Right in the middle is the woman who wears her pentacle to church every Sunday and she has a temple recommend and thinks that magic is the essence of what Joseph Smith restored. And then at the other end of the spectrum are women who have left the LDS Church and do not consider themselves Mormon at all but are still informed by their experience of Mormonism. Usually being a MormoPagan has at least something to do with the Heavenly Mother. One of the things I'll be exploring is the secularization of Mormonism. Some of the people I've interviewed believe that institutional Mormonism is spiritually bland. One of the ways I'll be approaching this is through the idea of secularization. Quinn touches on this a little. My MA thesis on Heavenly Mother looked at secularization as the privatization of unpopular ideas like plural marriage and Heavenly Mother. So my dissertation will also be looking at Mormon secularization, or its loss of magic, which is a response to Stark and Bainbridge's theory on secularization as a cycle of "cult" formation, assimilation, and resistance in the form of dissent and religious innovation. One of the things I want to discover is whether or not people are doing these things because there is increasingly less and less of a context for magic in Mormonism. Morehead's Musings: As I have reviewed your research it seems to indicate that Mormon women gravitate more toward this interesting synthesis rather than men. Is this impression correct, and if so, why do you think this is the case? And do you think that the coming together an interest in the West in the divine feminine and the Mormon concept in a Heavenly Mother might create a matrix that provides more interest in this orientation? Doe Daughtrey: To answer your first question, I've been really thinking about this. I don't know that I could prove it in any case, but for a long time I presumed that a belief in Heavenly Mother is likely to be more important to LDS women, but I've also met many LDS men for whom the idea of developing relationship to her has been really important to the development of their spiritual path. My biased assumption has been that women would be more interested in the Heavenly Mother than men, but I haven't actually asked that question very often of men. I'm beginning to believe that perhaps men might be drawn to different things than LDS women and also perhaps to different types of forums. For instance, I've joined the Mormon Mystics Yahoo! Group which is a very rich forum. There are all kinds of people on there, but they are mostly men. There are Freemasons, and Rosicrucians, and they study the Qabala, etc. There are women on the list, but there are mostly men. Then there's LDS-Reiki, which seems to have more women than men. It is easy to assume that LDS women, who lack the priesthood, are more interested in that group than LDS men, but I don't know that that's true. It also seems like LDS men get involved in Buddhist meditation as opposed to becoming Pagan, for instance, so I'm wondering if maybe Buddhism is something that appeals more to LDS men than it does to LDS women. So while I started thinking I was mostly interested in women's stories, the lived experience of men has become incredibly compelling to me too. Last night I happened to meet a couple of Pagan people at a coffee shop who ended up being ex-Mormon. The man told me this beautiful story about being on his mission. At some point he was out in a field that was an ancient sacred site, and he felt this incredible connection to the spirits of the land. By way, that's another parallel that I see. When we go into the temple we are taught that everything was created spiritually before it was created physically. So it is not at all incongruent to believe that you could go out into a field on your mission and communicate with the spirits of the land or feel connected to that energy. I found his story incredibly compelling. It's not that I'm not interested in men's stories, it's just that I started out thinking women would be more interested in these ideas and practices than men, and that assumption derives from questioning why men would need these alternatives if they had the priesthood. My own interest in LDS women derives from my experience of feeling like Mormonism gives men ritual tools with which they can access spiritual or physical healing for themselves or others but that is absent for women. I'm very aware now that priesthood doesn't solve men's needs either, completely. Men also have needs that, perhaps, aren't met by the priesthood. In terms of the divine feminine, that's another one of my interests because it was so important to me. But I do think that people like Carol Lynn Pearson, Margaret and Paul Toscano, Janice Allred, who have all done this incredible theological work on the concept of the divine feminine in Mormonism, have been very important in connecting the larger women's spirituality movement with Mormonism. If nothing else, their work creates the opportunity for connecting the two. One of the things I'm interested in finding out is the extent to which that may have happened with the women I talk to. One of my early suspicions was that Mormon women either expand their practice to include Heavenly Mother or that they leave Mormonism for Paganism for that reason, because she's "absent": She's there, but she's not visible. In reality I'm finding that that's only one of the reasons. I'm still doing my analysis, but it appears to me that these people are just looking for a deeper spirituality. Like another woman I met recently: She was very much a feminist; she got married in the temple, but she was also very resistant of Mormon patriarchy. That is really what eventually led her to leave the church. Heavenly Mother was just one piece of it. So that's what I want to discover: the whole story. Morehead’s Musings: How do those practicing this synthesis reconcile it with the Mormon religious system that seems to frown on such things? Doe Daughtrey: I guess I would just quote Gordon B. Hinckley who said over and over again that Mormons can believe whatever they want to so long as they don't try to convince anybody else. That's wide latitude, especially if the LDS Church doesn't ever really clearly define doctrine. 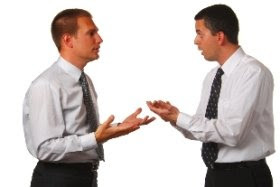 If you tell me I can receive personal revelation, and then you tell me I can believe whatever I want to believe so long as I do it "privately," then there are a lot of openings for all of these kinds of beliefs and practices to get expressed and elaborated during the week outside of church on Sunday. Initially I thought I'd find all these women who had left Mormonism; but increasingly I'm finding many more who are still in it, and that's even more interesting to me. Morehead’s Musings: Do you find that most of these people feel open in practicing these things in ward life or is that something they tend to keep to themselves? Doe Daughtrey: They don't go to Relief Society and say, "I went to Ramtha this weekend! Let me tell you what you're missing!" They just do it on their own. In the area where I am in Arizona, I show up at events and see people from my ward, people that I never would have thought would show up at alternative venues. There's one healer here who is very Mormon who has this very big healing practice. I went a couple of weeks to her free evening life skill seminar and every single woman there was Mormon--and there they were, talking about chakras! So it was very interesting to hear them put that into Mormon vernacular. And that's another part of what I'm looking for: What are the indigenous terms that Mormons use to articulate these ideas and practices? Morehead's Musings: How might folks assist with your dissertation research through interviews or other things? Doe Daughtrey: If someone wants to contact me, my email address is doe.daughtrey@asu.edu. The project has been approved by the ASU IRB board, and I will provide the paperwork, including forms that explain my responsibilities. For instance, participants are assigned pseudonyms and therefore remain anonymous. You have to be at least 18, have a background in Mormonism, though you don't have to be practicing currently. I've actually met some incredibly wonderful women lately who are married to LDS men, but who aren't Mormon themselves. So far, every one of these women want to become Mormon precisely because of the magic they see inherent in Mormonism. So anybody who meets those criteria and believes in a form of rebirth, channeling, astrology, energy work such as Reiki or other healing modalities, divination (tarot, pendulums, etc. ), Goddess spirituality, herbalism and related kinds of things. Anybody who has done these things or is doing these things. I'd even be interested in hearing from people who used to do them but for whatever reason feel it is now inappropriate. I'd like to know why. Morehead's Musings: Doe, thanks again for sharing this. I look forward to seeing how your research develops, and to meeting with you during your next trip to Utah. 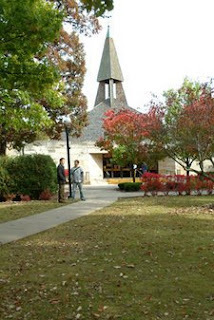 Trinity International University, in conjunction with the Lausanne Committee for World Evangelization Issue Group 16, The Church and New Spiritualities and the Western Institute for Intercultural Studies, announces an international conference on Christianity and new religious movements hosted by the School of Biblical and Religious Studies at Trinity International University in Deerfield, Illinois, USA on 16-19 October 2008. The conference will be a gathering of practitioners and scholars addressing the decline of Christianity in the West and the concomitant growth of new unreached people groups expressed in religions and spiritualities such as modern Paganism, New Age, and other alternative spiritualities. Plenary sessions and parallel workshops will address the topics of the future of religion in the West, the make up of the alternative religious marketplace and approaches in engaging adherents of alternative spiritualities. For more information, contact Dr. Michael T. Cooper, Program Director, Master of Arts in Communication and Culture. Further information and registration arrangements can be found at Sacred Tribes Journal, which includes the plenary and workshop schedule.